Ear training. Sight-Singing. Essential Music Theory. Rhythm Training. The complete music theory trainer on PC and Mac. For musicians of all levels. Advanced music theory and ear training on iPad. The App of choice for real progress. Cloud solution for music schools and choirs to teach ear training and sight-singing at all levels. Just like at the music school and readily available on your PC, Mac or iPad. EarMaster 7 is the perfect tool to become a better musician. With more than 2500 interactive lessons for all levels covering ear training, sight-singing practice, core music theory and rhythm training, it will take your musical skills to the next step, regardless of your current level. EarMaster is not only for individual musicians. It is also used by thousands of music schools to accompany regular music theory, ear training or musicianship courses in music schools at most levels. Some of the world’s best music schools are already using EarMaster Cloud, a unique solution that includes student and teacher access to EarMaster on PC, Mac and iPad, as well as assignment and result syncing over the Cloud. EarMaster can now be extended with add-on courses. The first add-on is RCM Voice - Levels 1 to 6. It will help you prepare for the voice exams of the Royal Conservatory for levels 1 to 6 and be ready for the big day. It contains a progressive set of exercises that follow the RCM's requirements for ear training, sight-singing and rhythm study. Just need basic ear training? 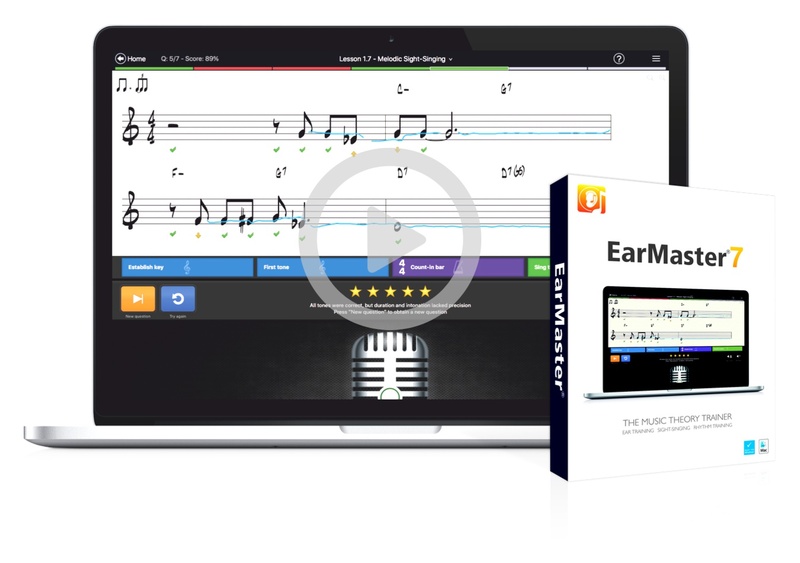 Rejoice then, because EarMaster 7 is now available as an unlimited free version containing the first lessons of the Beginner’s course, Customized Interval Identification exercises, and Chord Identification exercises. And if you need to get more serious about your musical training later on, you can simply get a license for the Pro version to unlock the rest of the application! I quickly found out that ear training was important. Finally a comprehensive ear training program that truly suits our needs at UNR. I have been a big EarMaster fan for many years!! You cannot become a musician if you are not training your ears. "To help get your ears to the next level, EarMaster ApS has brought out their EarMaster Pro 6 software, a program designed to get you to the next level of listening skills in a fun, educational and personalized manner." "This is a terrific program - one that I know will quickly become a staple in my computer lab."